I went to Philadelphia to see Mexican Modernism. 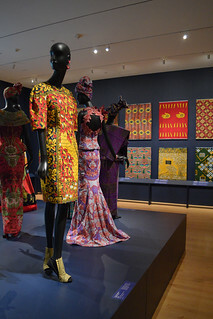 However, I came back unable to stop talking about the Vlisco show. It was one of the better shows I’ve seen in general and packing everything into a single gallery resulted in a wonderful density of subjects to cover. First, the actual fabric itself is a fantastic illustration of globalization. 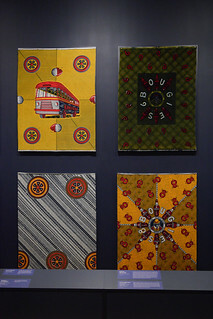 This particular batik technique originated in Java. It got taken to the Netherlands by Dutch colonists where the manufacturing process became automated. 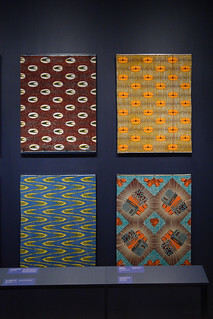 The resulting fabric then got taken by the Dutch to different African countries for market. 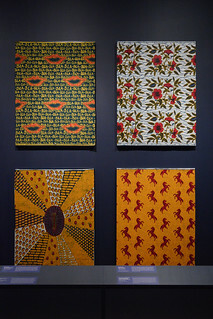 The resulting fabrics are both authentically African but also truly international. 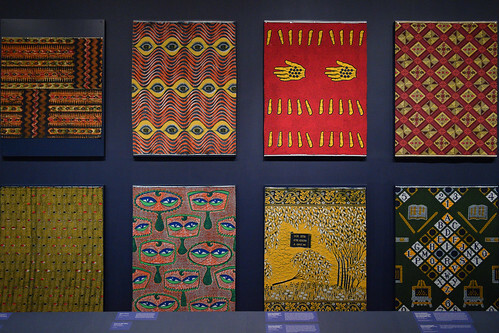 The Dutch sold different patterns in different countries so, while there are similarities in terms everything being Vlisco, there are also distinctions between countries and the exhibition does a good job at flagging how those different patterns came to represent different countries. One of the fun things with the Vlisco patterns is how they get repeatedly reworked and referenced. It’s not just that a pattern gets printed and reprinted in multiple colorways—which can look completely different even if the pattern itself is the same—instead elements of the old, classic patterns are sampled years later. So the roundels which represent the wheels on a bus pattern become a pattern of circular devices. Or the swallows in a pattern or replaced by airplanes. Or maybe the swallows themselves get sampled and turned into a tesselation. The designs and devices are in a constant state of remixing—giving the entire industry a sense of vitality and energy. The show wasn’t just a collection of patterns over time. That would’ve been easy and obvious and kind of boring. Instead all the remixes were paired and grouped with the their sources so that the relationships could be called out and viewed. The point isn’t just the history of the fabric, it’s in how that history is constantly self-referential. Viewing just the patterns and how they reference each other would’ve been a decent show in its own right. 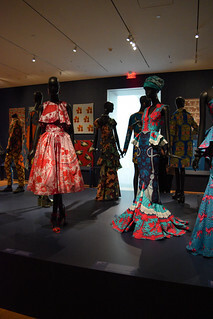 But there were also a ton of dresses on display which took the entire room to a different level since many of the dresses used prints which were on display. Being able to see the flat printed patterns makes looking at the dresses a wonderful puzzle where you can figure out how the fabric is used based on the way the print shows up in the garment. And the designers do absolutely insane things in how they embrace the printed patterns. Some of the dresses rotate the warp/weft to get the right print alignment. Others creating the cutting/seam pattern around the print itself so as to avoid certain elements—typically words or lettering. 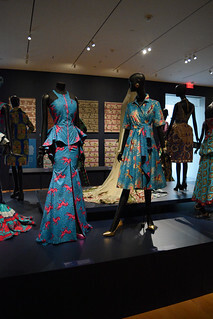 Many of the dresses have cut the fabric along the lines of the print itself so that instead of a straight seam the edge of the garment is irregular and the fabric becomes its own trim. The dresses also showed exactly how different the patterns can look depending on the colors they’re printed in. 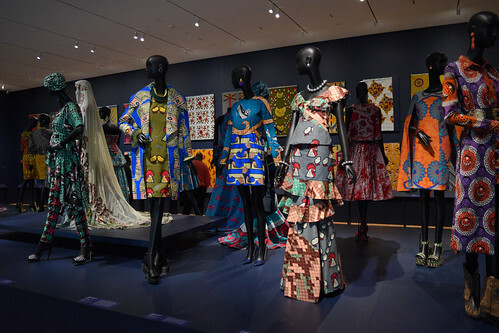 Again, as with the patterns on the wall, the dresses which use the same print were displayed next to each other. However, because the garments are so different, I could be looking at two dresses for minutes and not realize that they were using the same print. It’s not enough that they different when one is printed in cyan/red/navy and the other is pink/red/maroon, the resulting difference in character also suggests completely different styles of dress. 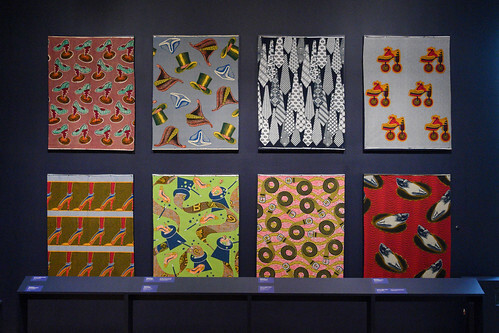 With all that, the show still managed to find space in the gallery to have a large display about the process of dying the fabric. I love seeing these in general but this display used fabric samples which were the same size as every other sample on the walls. Instead of being an afterthought or a concession, it was an integral part of the show. Not only did the process information show how the fabric is printed, it showed the different ways that variants could be produced. It’s simple to think of different colorways as just being using different inks in each step. But steps can be omitted or added as well and the combination of these differences opens up a huge number of variants of the same print. Anyway, history, technology, design, culture, marketing, evolution, process, fashion, fabrication, color, and pattern. All in one room. All working together so the density of information makes sense. This show was great. Too bad there wasn’t a catalog. This entry was posted in Philadelphia Museum of Art, review. Bookmark the permalink.